Charles Ormond Eames, Jr (1907–1978) and Bernice Alexandra "Ray" (née Kaiser) Eames (1912–1988) were American designers, who worked in and made major contributions to modern architecture and furniture. They also worked in the fields of industrial and graphic design, fine art and film. Charles Eames, Jr (June 17, 1907 – August 21, 1978) was born in St. Louis, Missouri. Charles was the nephew of St. Louis architect William S. Eames. By the time he was 14 years old, while attending high school, Charles worked at the Laclede Steel Company as a part-time laborer, where he learned about engineering, drawing, and architecture (and also first entertained the idea of one day becoming an architect). Ray-Bernice Alexandra Kaiser Eames (December 15, 1912 – August 21, 1988) was an American artist, designer, and filmmaker who, together with her husband Charles, is responsible for many classic, iconic designs of the 20th century. She was born in Sacramento, California to Alexander and Edna Burr Kaiser, and had a brother named Maurice. After having lived in a number of cities during her youth, in 1933 she graduated from Bennett Women's College in Millbrook, New York, and moved to New York City, where she studied abstract expressionist painting with Hans Hofmann. She was a founder of the American Abstract Artists group in 1936 and displayed paintings in their first show a year later at Riverside Museum in Manhattan. One of her paintings is in the permanent collection of The Whitney Museum of American Art. In September 1940, she began studies at the Cranbrook Academy of Art in Bloomfield Hills, Michigan. She met Charles Eames while preparing drawings and models for the Organic Design in Home Furnishings competition and they were married the following year. 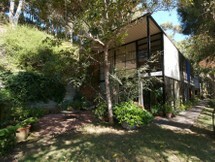 Settling in Los Angeles, California, Charles and Ray Eames would lead an outstanding career in design and architecture. In 1943, 1944, and 1947, Ray Eames designed several covers for the landmark magazine, Arts & Architecture. In the late 1940s, Ray Eames created several textile designs, two of which, "Crosspatch" and "Sea Things", were produced by Schiffer Prints, a company that also produced textiles by Salvador Dalí and Frank Lloyd Wright. Original examples of Ray Eames textiles can be found in many art museum collections. The Ray Eames textiles have been re-issued by Maharam as part of their Textiles of the Twentieth Century collection. Ray Eames died in Los Angeles in 1988, ten years to the day after Charles.